"Dat Night" is the latest song from Chris Brown as he heads toward the release of 2017 album Heartbreak On A Full Moon. 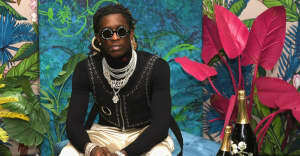 The song, which you can hear below, features Trey Songz on the chorus and a wild verse from Young Thug in which he pushes his voice in even wilder directions. Writing about the song on Twitter, Brown described "Dat Night" as something he “Did this for the fans." Check the song out below.